testimony of that fact with our beautiful beveled cross pendant. The sleek, modern design reminds you that Jesus is a Savior for all time and for all people everywhere. 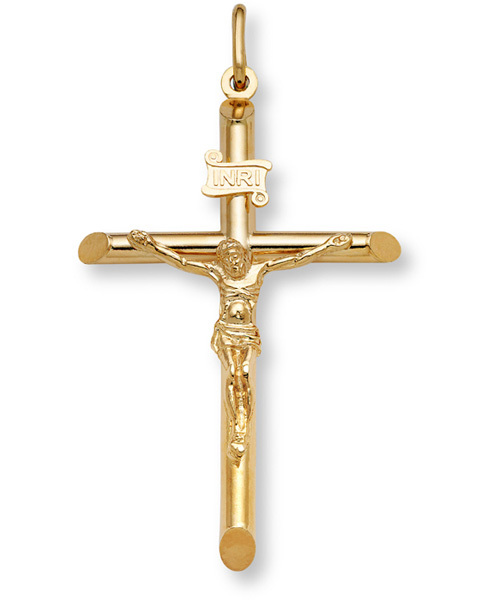 The edges of this striking 18k gold cross are polished, providing a gleam that reflects His glory. Perfect for Christmas gift-giving or to satisfy your own desire for an emblem that proclaims your faith. The cross measures 30mm x 16mm (1.18″ x 5/8″), making it perfect for either men or women. The hoop measures 5.6mm x 2.7mm to accommodate your chain necklace or add one of our 18k gold box chains in 0.7mm in either 18″, 20″, or 24″. 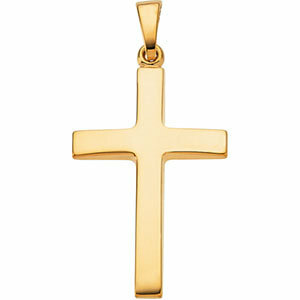 It’s part of our wonderful collection of Gold Crosses but is available in platinum or sterling silver as well. Whether you want to say “you’re the keeper of my heart” or “forever friends,” this engravable gold disc will be a treasured gift this year. It’s 1″ measurement means that you can say something your heart wants your loved one to hear all the while presenting a gift that just keeps on giving. 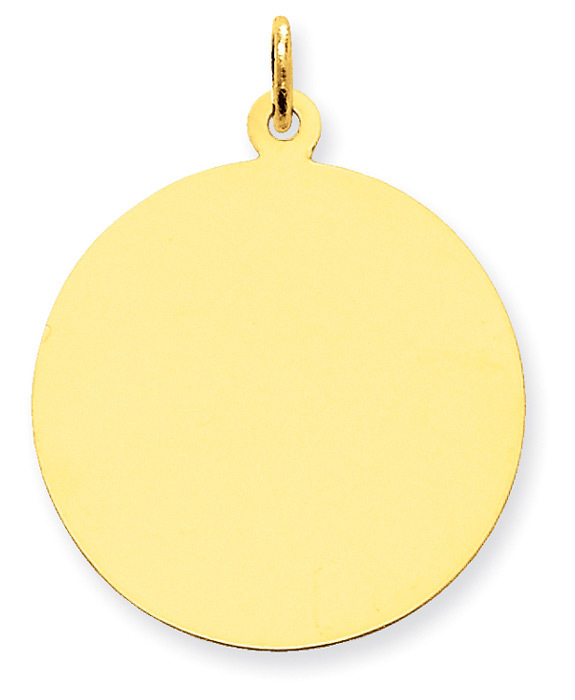 Because of its simple beauty, this gold charm pendant is suitable for dressing up or dressing down, in town or in the country, at night or all day long. 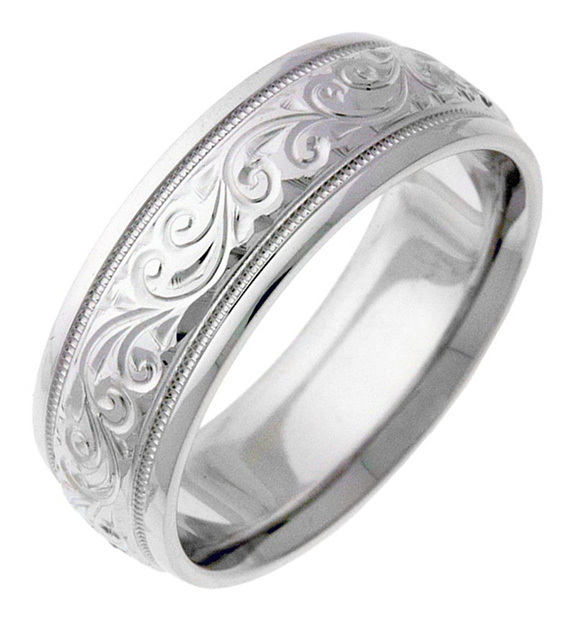 Both sides are engravable, and you’ll find this piece along with others in our collection of New Jewelry here at Apples of Gold. can give any day of the year but may be especially appreciated during the time when we celebrate the birth of the One who gave His life so that we might live. You said you wanted a substantial crucifix made in solid gold, and we listened. This beautiful crucifix is the result! The image of Jesus is intricately detailed and the tubular shape of the cross is indeed solid gold, not hollow like many crucifixes are. It is a weighty piece suitable for passing down through the generations as you teach your children and grandchildren the way of the cross. 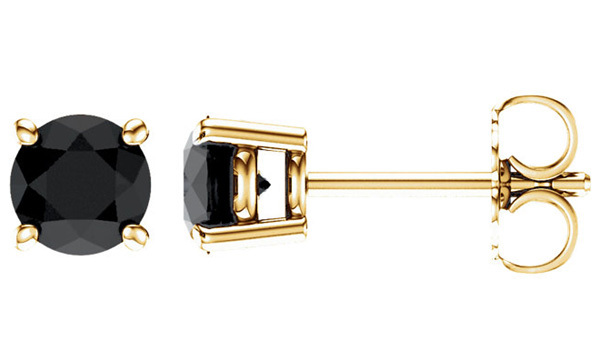 See more in our stunning collection of Gold Crosses. At the time of year when we are remembering the birth of the Christ Child in a manger in Bethlehem, we see down the road to where some thirty years later that same Divine One would render His life on a cross of shame to break the power of sin and hell for those who would receive His name. 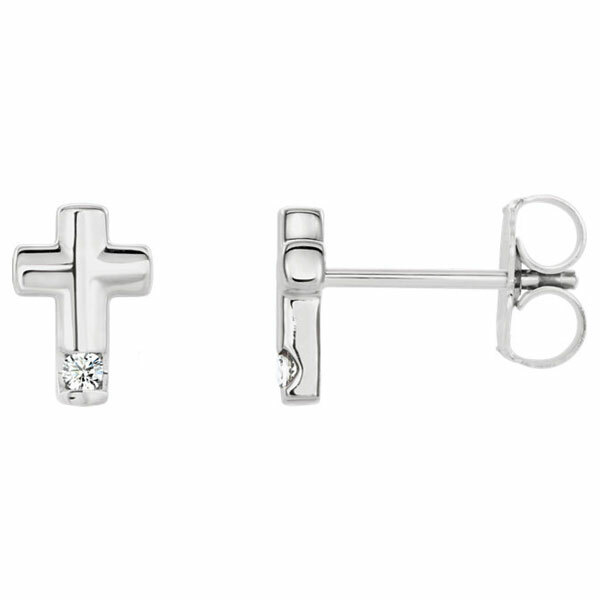 That’s why these diamond cross stud earrings in 14k white gold would make the perfect gift for a lady who loves the Lord. Small, sweet, and yet powerful in their message, the 0.03 carats of diamonds remind us of the treasure that the cross holds. These precious earrings are 5/16″ by 3/16″ in size and feature a secure friction pushback closure. She’ll wear them every day from now on! Part of our Jewelry Gifts collection from Apples of Gold. 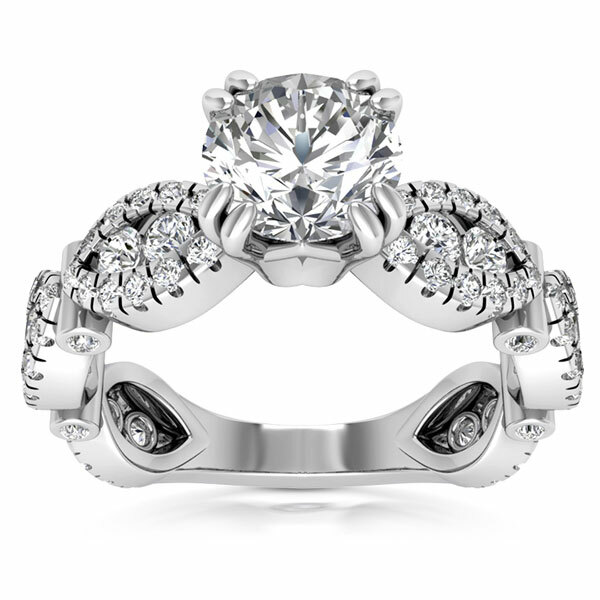 solid 14k white gold! 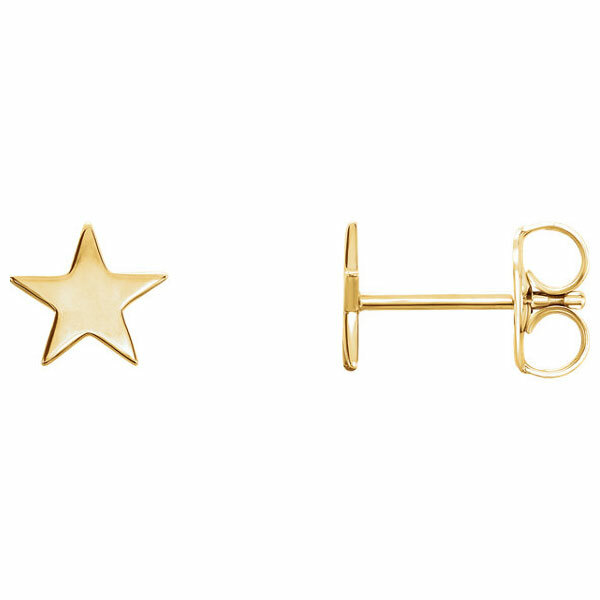 So very popular among our stud earrings, it is among our patrons’ favorites even with its “new” status. And we can understand why! 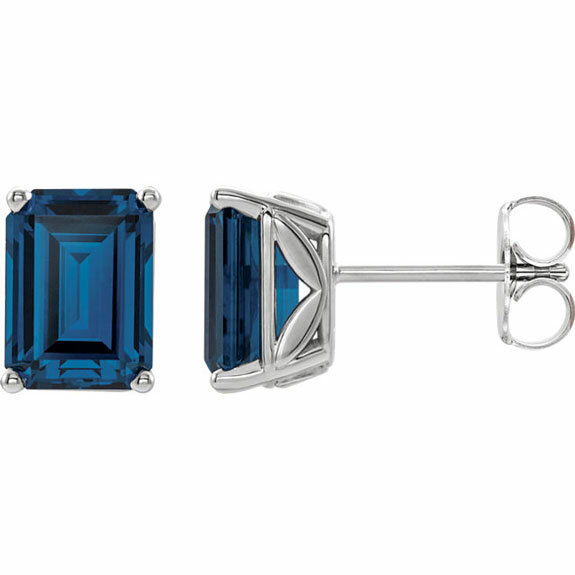 These 8mm x 6mm emerald-cut gemstones are settled securely in a four-prong setting that is anything but ordinary. Apples of Gold has created the white gold baskets with a special design so your earrings stand out as truly unique. Whether she’s dressing up or dressing down, she’ll not only appreciate the glamour of these intensely blue and sparkling white beauties, she’ll never want to go anywhere without them! 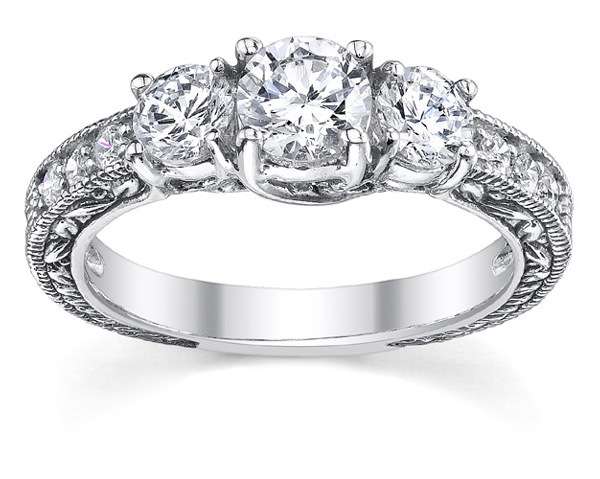 Also available in 18k or platinum (please allow 7-10 days for platinum). Comes with secure, friction push-back post closures. Made to order in the U.S.A. Please allow approx. 5-7 business days before shipping. Christmas is coming… order soon! Part of our exquisite collection of New Jewelry from Apples of Gold.